Choose the sink to make the best use of available space and to suit the style of your kitchen. If you don’t have an automatic dishwasher, the kitchen sink must be large enough to cope with a considerable volume of washing-up (don’t forget to allow for larger items, such as baking ttys and oven racks). In addition, check that the bowl is deep enough to allow you to fill a bucket from the kitchen tap. If space allows, select a unit with two bowls. If you plan to install a waste disposal unit, one of the bowls will need to have a waste outlet of the appropriate size. Some sink units have a small bowl designed for waste disposal. A double drainer is another useful feature; if there’s no space, allow at least some room to the side of the bowl, to avoid mixing soiled and clean crockery. 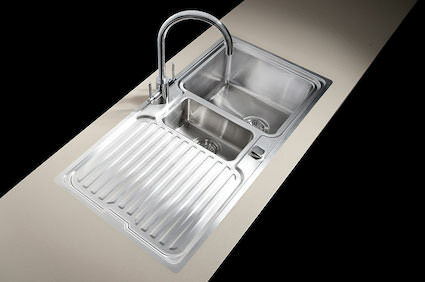 One-piece sink tops are generally made to modular sizes to fit standard kitchen base units. However, many sinks are designed to be set into a continuous worktop – which offers greater flexibility in size, shape and, above all, positioning. Except for being somewhat taller, kitchen are comparable in style to those used for washbasins. They also incorporate similar mechanism and are fitted using the same methods. A kitchen mixer, however, has an additional feature: drinking water is supplied to it from the rising main., whereas the hot water usually comes from the same storage cylinder that supplies all the other hot taps in the house. A sink mixer should have separate waterways to isolate the one supply from the other until the water emerges from the spout; otherwise, you must have special check valves to prevent possible contamination of your drinking water. If you want a double bowl sink, choose a mixer with a swivelling spout. Some sink mixers have a hot-rinse spray attached for removing food scraps from crockery and saucepans. Many mixers taps are supplied with small-bore copper or flexible tail pipes, which are joined to the supply pipes by a compression-joint or push-fit reducer.